Florida State quarterback Marcus Outzen is sacked by Tennessee's Roger Alexander, top, and Billy Ratliff during the Fiesta Bowl on Jan. 4, 1999, at Sun Devil Stadium in Tempe, Ariz. The Vols won the BCS national championship that night, and Ratliff helped them get to that point undefeated with his heads-up fumble recovery against Arkansas on Nov. 14, 1998, during the regular season. 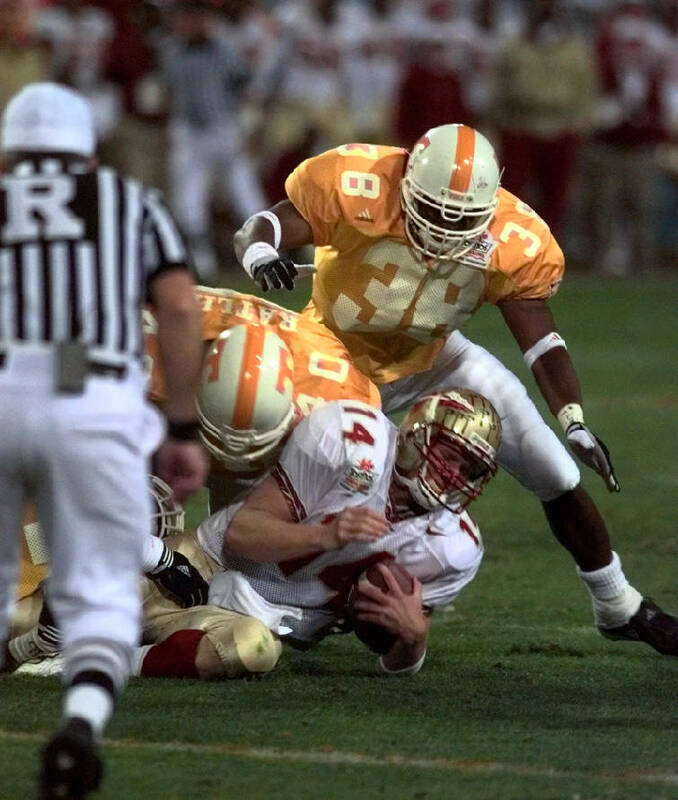 Editor's note: This is the ninth part of a series reflecting on the 1998 University of Tennessee football team that finished 13-0 and won the BCS national championship. This story by Ward Gossett was originally published 20 years ago. KNOXVILLE — Top-ranked Tennessee had to fall back on a miracle — and did so quite late — to defeat 10th-ranked Arkansas 28-24 here Saturday afternoon. The expected victory came only after the crowd of 106,365, a CBS TV regional audience and a host of bowl scouts endured numerous heart palpitations. And the win finally fell into UT's lap in unexpected fashion as the Volunteers bumped Arkansas from college football's diminishing list of unbeatens. It took a fumble recovery by Billy Ratliff with less than two minutes to play and the piston-like legs of bullish Travis Henry to complete the comeback, which had all the trappings of divine intervention. Henry, who finished the game with career highs in rushing attempts and yards (32-197), scored with 0:28 left in the game on a 1-yard dive. The run gave UT its first lead of the afternoon and finished off a five-play drive in which the sophomore tailback from Frostproof, Fla., was the featured attraction. "We huddled up and Tee (Martin) and the offensive line told me to take it to the promised land. They called my number and I did what good players do in big games step it up," said Henry, who was making his first collegiate start after averaging more than 100 yards per game over UT's previous three contests. Arkansas quarterback Clint Stoerner, who had three first-half TD passes, went rather quickly from probable hero to the most unlikely of goats when he fumbled at his own 49 as the Razorbacks tried desperately to run out the clock. UT defensive tackle Ratliff pounced on the ball at the Razorbacks' 44 with 1:43 to play. From there it was Henry on five straight carries. Operating behind the Vols' charging line, the sophomore from Florida ripped off runs of 16, 15 and 11 yards to get his team to a first-and-goal at the Razorbacks' 3-yard line. He banged inside for a couple and then, on a quality, second-effort run, finally scored UT's go-ahead touchdown with all but 28 seconds gone from the gut-wrenching and emotion-draining game. "I think anything I said would probably be anticlimatic," said Vols head coach Phillip Fulmer. "I believe in determination," responded UT's coach when asked if he believed in miracles. "It's a win. We're proud to get it, and we'll take it." Asked when he thought his Vols had the game won, Fulmer grinned the broadest of grins and replied, "When the clock read zero-zero-zero." A 10-point underdog, Arkansas arrived here with a lot of confidence and proved it by jumping out to a 21-3 lead, then going into the dressing room at halftime with a 21-10 advantage. "You've got to give Arkansas a lot of credit," Fulmer said. "They came ready to play." But Fulmer also was heaping a lot of praise on his own team. The Volunteers, who had to scramble from behind to win the season-opener at Syracuse, won in overtime in their home opener against Florida. They had not been behind since a 3-0 deficit in the first quarter of that contest with the Gators. "Some teams would've given up," he said. With six minutes left in the game, the Volunteers were staring at a four-point deficit when Deon Grant blocked a punt and linebacker Al Wilson returned it to the Arkansas 35. The offense failed to capitalize, a fourth-and-10 pass from Tee Martin to Peerless Price falling incomplete. But on the ensuing Arkansas series, a high snap on a punt was kicked out of the end zone by Razorbacks punter Chris Akin for a safety. It allowed UT to close within two points at 24-22 with 3:04 to play. The Vols were unable to move after fielding the free kick afforded Arkansas following the safety and turned the ball over on downs with 1:54 to play. It appeared that Arkansas, which entered the game 8-0 (5-0 in the Southeastern Conference), would be able to run out the clock. But Stoerner, scrambling to his left on an rollout option, lost his balance and the ball, and Ratliff was there to pounce on it, giving UT new life for what seemed the umpteenth time. "I don't think he realized how tired he was, but nobody but Henry was going to carry the ball," said Fulmer. Henry, who has said repeatedly that he gets stronger as the game goes on, plowed, bounced, plugged and chugged to get down to the Arkansas 1. On second-and-goal, he caromed off a tackler and, with super second effort, crashed over for UT's first lead of the afternoon. It ruined a superb Arkansas effort with scouts from the Fiesta, Sugar, Citrus, Orange, Outback, Cotton and Peach bowls on hand. "I hate to lose one like that. I've never lost one like that. Tennessee was real fortunate to win," said first-year Razorbacks coach Houston Nutt. "There's a fine line between winning and losing. They're the No. 1 team in the country. Arkansas is a pretty good team. We gave Tennessee a great gift and it really hurts to lose one like that."